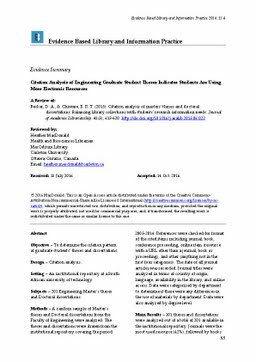 Objective - To determine the citation pattern of graduate students' theses and dissertations. Design - Citation analysis. Setting - An institutional repository at a South African university of technology. Subjects - 201 Engineering Master's theses and Doctoral dissertations. Methods - A random sample of Master's theses and Doctoral dissertations from the Faculty of Engineering were analyzed. The theses and dissertations were drawn from the institutional repository covering the period 2005-2014. References were checked for format of the cited items including journal, book, conference proceeding, online item (resource with a URL other than a journal, book or proceeding), and other (anything not in the first four categories). The date of all journal articles was recorded. Journal titles were analyzed in terms of country of origin, language, availability in the library, and online access. Data were categorized by department to determine if there were any differences in the use of materials by department. Data were also analyzed by degree level. Main Results - 101 theses and dissertations were analyzed out of a total of 201 available in the institutional repository. Journals were the most used resource (42%), followed by books (30%), other (12%), online (10%), and proceedings (6%). Doctoral students used a higher percentage of journals than Master's students. Departmental usage differed. Mechanical (54%) and Chemical (48%) Engineering students mainly used journals. Civil Engineering students mostly used resources from the "other" category (31%). Students in Industrial (41%) and Construction (40%) Engineering mostly cited books. Analysis of the "other" category showed a wide variety of resources used (emails, personal interviews, course notes, conference papers, government publications, national and international standards, manuals and guides, technical reports, and technical notes). The technology university provides access to 79% of the journal titles used by engineering students in their theses and dissertations. 84% of titles are available online. Students mainly used current articles (i.e., from 2000-present). Students heavily favoured journals from the United States of America and Europe, although South African journals were the fifth most cited by country. English language titles dominated, however Portuguese and French titles were the next most commonly cited. Seventy-four titles were referenced more than 10 times. Conclusion - The authors state that more electronic resources are being used by graduate students, including "online" information. Journals are the most cited information resource held by the library and the majority of journal titles that were cited can be found in the library. The authors conclude that librarians should work with graduate students to encourage the continued use of library resources. They also state that this information can be useful for identifying journals that could be canceled in times of budgetary cutbacks. The authors note that this study provides the university libraries with insight into the use of library holdings, but being limited to engineering, a more comprehensive study of subjects would provide a broader picture of the collection's use and provide valuable information for collection development.